We need to go through all our old photos and see if we have any that show the Marriott back around June/July 2005. Agreeing with Klaas on the Aruban officials never "chasing" anything in this case! 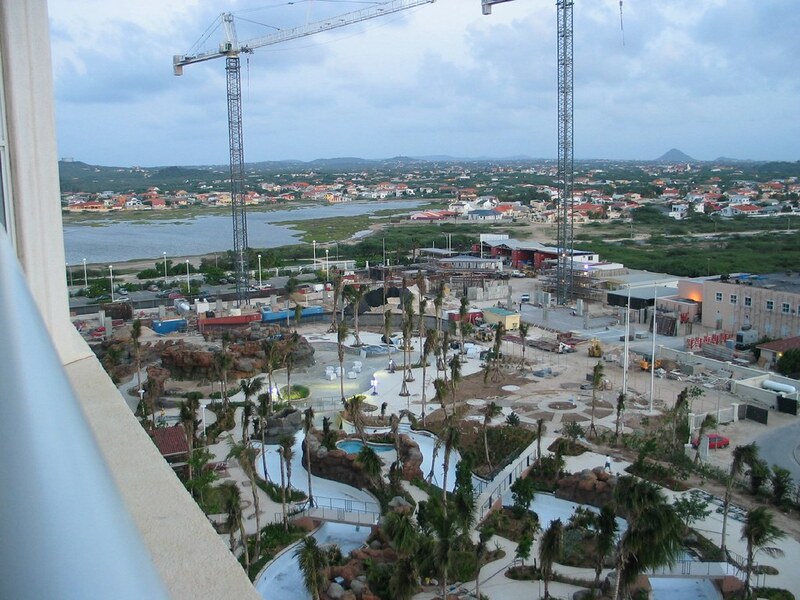 The Marriott Spyglass Tower in Aruba started construction in 2005 and completed in 2007. I'll try to find the ground breaking date. TM - check your email, I just sent something I need your opinion on. Thanks! Sorry, Klaas! Just saw this but I'm checking it now! Default Help - Marriott Surf Club construction? 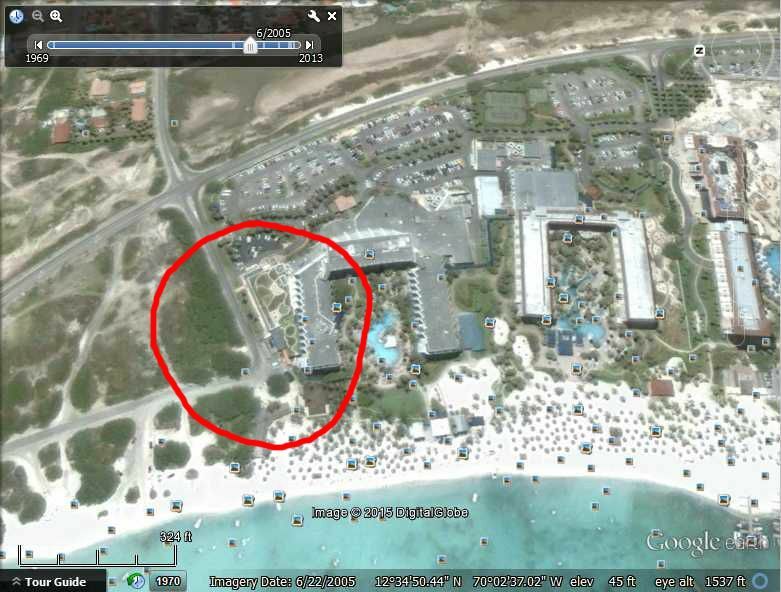 Planning first trip to Aruba in August 2005 with family and have nice chance at Marriott Surf Club. I've been reading so much about the construction upheaval (marina blocking ocean, cranes, blue towels, pools not done, etc., etc.) that I'm not sure what to think. Does anyone know where it stands now? Anyone willing to project where it may be come August? 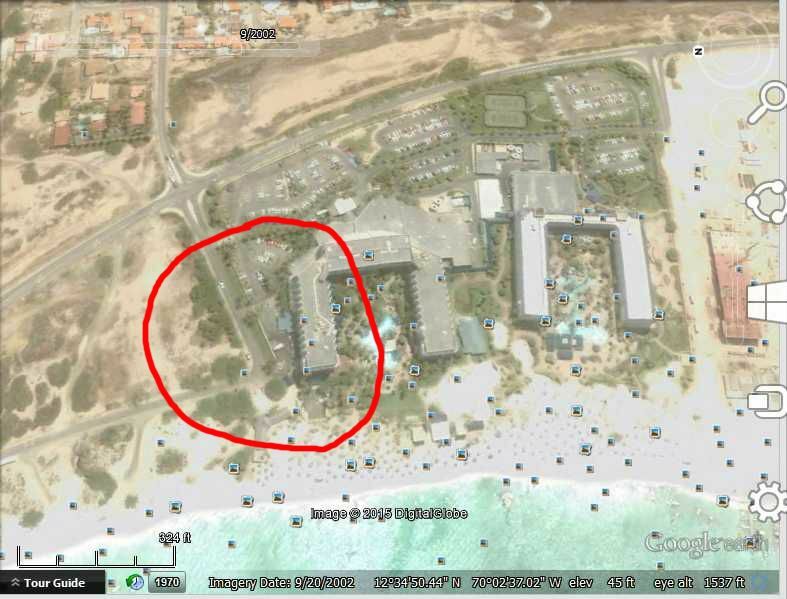 Default Re: Help - Marriott Surf Club construction? We stayed at the Surf Club this past November. The villas are just beautiful. So nice having a washer & dryer right in the kitchen closet. The one pool that is opened was just great. Big, and had a swim up bar. They were working on the second building but the construction didn't bother any of us. Once in a while we may have looked up to watch a huge crane in action. As far as the beach goes, we mostly stayed by the pool. The Surf Club has put in lots of palapas on the beach and yes, you do have to walk towards the Ocean Club to swim, but in my eyes, not really an inconvenience. I wouldn't hesitate about staying there in August. So much more will be completed (well I hope so). I'll be at the Ocean Club in May so I'll let the board know how the Surf Club is coming along when I get back. 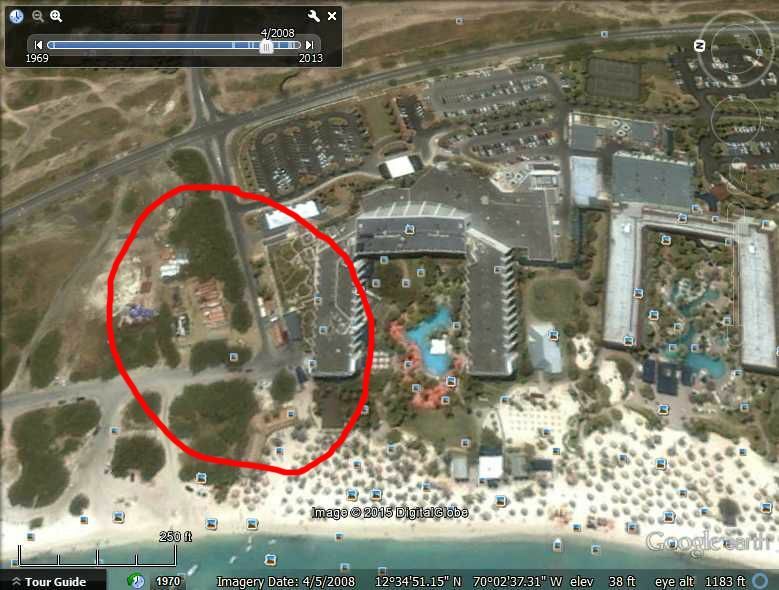 Construction at Marriott Aruba Surf Club was just recently completed. The first phase is presently was open in 2006. Phase 2 opened in the spring of 2006 and Final Phase opened for guests in late 2007. Contact us and Job Fairs. Aruba Marriott Resort and Stellaris ******. Perched along the turquoise Caribbean Sea, and bounded by untamed desert beauty, the Aruba Marriott Resort and Stellaris ****** is a true resort oasis, and a most magnificent setting for leisure and meeting needs. On June 24, 1995 the 413-guestroom resort officially opened its doors to the public; two weeks later on July 7th the resort added the Stellaris ****** to its portfolio. The Aruba Marriott Resort and Stellaris ****** was an instant success as it became the largest premier chain resort on the island. As a potential future Marriott Associate you would be joining a resort that currently boasts the most spacious guestrooms and balconies, largest ******, a state-of-the-art ballroom, longest stretch of beach, and friendliest associates in Aruba. Marriott's Aruba Ocean Club. Kissed by the sun and reflecting the crystal clear waters of the Caribbean, Marriott's Aruba Ocean Club is a treasured vacation-ownership jewel of Aruba's Palm Beach. Entertainment and adventure fun for all ages surround this oasis with exciting water sports and ocean excursions. Infused with Caribbean style, the spacious one- or two-bedroom villas offer a welcome retreat. A private balcony, formal living and dining areas, and full kitchen are among the many impressive amenities included in each suite. The 311-room Ocean Club opened in two separate phases, the first in January 1999 which included the North Wing and the Atrium; this was followed by the rest of the property which opened later that year in September. Marriott's Aruba Surf Club. Located beachfront on the sands of Palm Beach, Marriott's Aruba Surf Club is surrounded by turquoise waters and island flair that is unmistakably the Caribbean. Views from two-bedroom, two-bath villas set the stage for an unforgettable vacation. Guests can relax on the private balcony or enjoy the convenience of a fully equipped kitchen and spacious living area. After resting up they can head to the adventure of a beachfront swimming pool with lazy river, slide and spa. The first phase of the Surf Club, showcased by the 330-room Lighthouse Tower opened its doors on July 2, 2004 to a 95% occupancy; this is the largest resort opened by Marriott to have a full-house on its inaugural day. The second phase was completed in February 2006 and the third and fourth phase opened in November 2007. Work made fun gets done, especially when we choose to do serious tasks in a lighthearted, spontaneous way. Play is not just an activity; it's a state of mind that brings new energy to the tasks at hand and sparks creative solutions. 1996-2006 Marriott International Inc.
Our best bet to show the construction is if Rob has some pictures when he was there in June or July 2005! Red may have some photos too. I'll dig around the next few days and see what I can find. Lighthouse Tower is the yellow/green building closest to beach. Compass Tower is directly behind it, Spyglass Tower is the L shaped building on right. Preparing to fill the Lazy River at Marriott's Aruba Surf Club 2005. We found the Marriott Surf Club by faith or a solid recommendation from the person who was helping us decide where to spend our 2006 vacation. 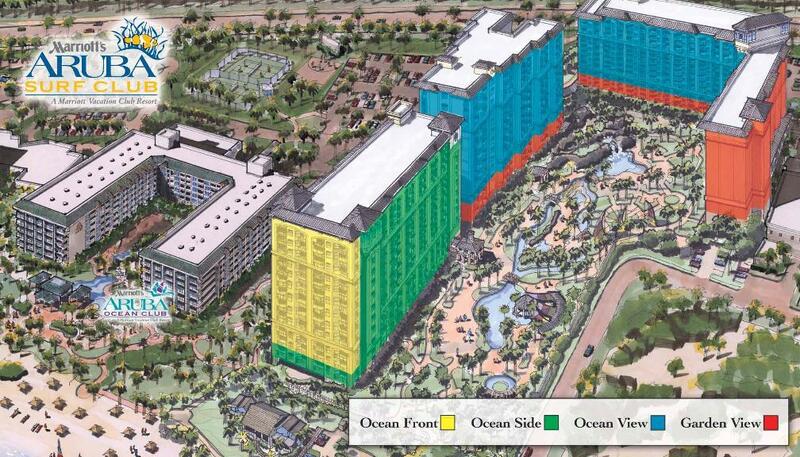 Anyway, not knowing what to expect other than it was one of Marriott’s newer resorts we decided to take the leap. The resort was about 60% complete, although livable since it is right on the beach. Here is a shot of the Spy Glass Tower construction. 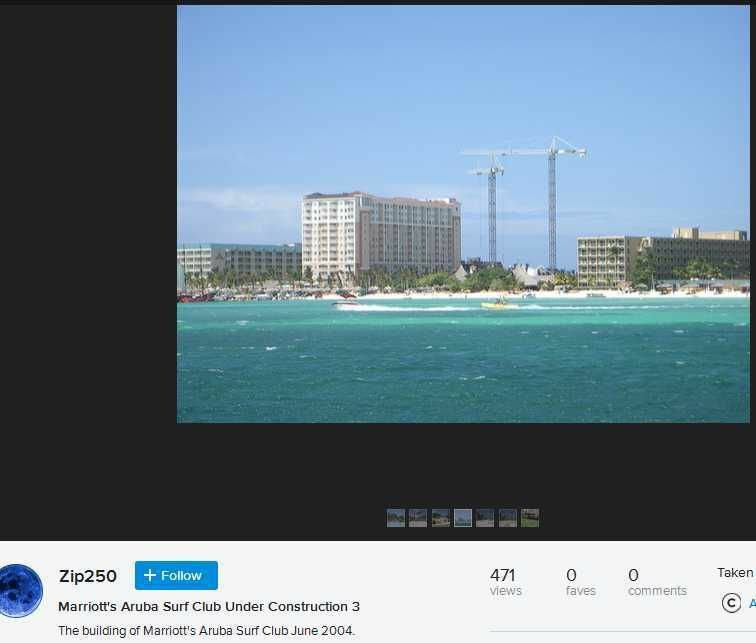 There are several more pictures at the link of the Marriott Surf Club construction, as you scroll down the page each picture leads to an album. Click on the picture to see more in the album. if you go to google earth and look under "view" (top left), there is a "historical images" option. 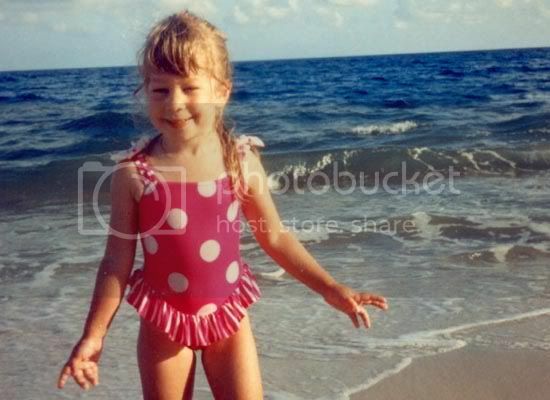 go to palm beach and search for the marriot and move the date slider to june 2005 to see the most applicable picture (june 22 2005 i think). there is not much built that i can see. lots of materials and equipment. i've tried to figure out how to post a screenshot, but i can't. sorry. if anyone speaks to beth, dave or matt, please tell them my thoughts are with them this month, as always. thanks! Thanks for the reminder on Google Earth! DIdn't know it went that far back in time now. Cool! Here are a couple images. I am looking thru all of my pics to see if I can't find something. Problem is I don't specifically remember searching near there. Trying to see if I don't have pics with the Marriott construction in the back ground. Either down from Pond draining, down from the Racquet club or on general from the beach. I can remember searching in some marshes that I thought I got this area in photos in the background. Wow-seriously great links. Thanks all. The guy's story sounds plausible to me-worth looking into in my view-what could it hurt? Page created in 2.398 seconds with 19 queries.